How to Restore Active Directory? There are abundant reasons why Active Directory (AD) is certainly the most fundamental constituent in Microsoft networking. The Active Directory together with its .DIT database forms the base for a number of applications, including MS Exchange. It is a repository of all non-store related information that typically includes configuration data for each Exchange server and its associated virtual server. The administrators need to interact with the Active Directory database whenever they create users, groups, or perform other similar tasks. For replication purposes, each Domain Controller (DC) keeps a writable copy of the AD database. An Active Directory site helps domain controllers to replicate each other. An AD site usually consists of physical units (wires, cables, routers) and logical units (Active Directory configuration, IP Subnet, etc.). AD sites are also used in routing and sending emails (for instance, in Exchange server 2007). So, from the perspective of Exchange, they are vital to the health of the environment, responsible for a perfectly working Exchange Server. Any type of corruption in the Active Directory may trigger a number of problems. The directory may contain some incorrect values. As a consequence, you may require reinstalling the domain and the server and ultimately, all the user mailboxes will be lost. Moreover, the AD database can also get corrupt due to a power surge or hardware failure. In the event of AD database corruption on a domain controller, you may try restoring the database. To restore Active Directory database or roll back all changes made to the database, you need to perform an authoritative restore. For this, first perform a System state restore of the domain controller and then use the NTDSUTIL command for overwriting existing information in the directory. If you could somehow perform a successful restoration of the AD database and still continue to face problems in accessing the Exchange data, use Stellar Repair for Exchange to recover your valuable user mailboxes. 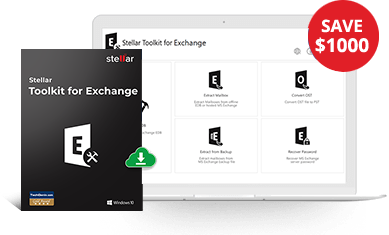 Stellar Repair for Exchange is an adroit tool that implements safe and powerful mechanisms to repair corrupt Exchange databases and restore precious mailbox data along with all public folder items. The software performs a precise recovery of various mail items, including email messages, contacts, appointments, tasks, notes, calendars, journals, etc. The eminent tool allows selective recovery of user mailboxes and also displays preview of mailbox components prior to recovery. Furthermore, it is compatible with Windows 7, Vista, Server 2003, XP, and 2000.